As if reading about the continued lives of our favorite characters from Pride and Prejudice and that of their children is not fascinating enough, send one Georgiana Bingley to seminary in France, throw in a murder with the rumor of a werewolf, and you potentially have something quite interesting. Such is Marsha Altman’s Georgiana and the Wolf, the sixth installment of her Pride and Prejudice Continues series. If you have not read any of the previous books then you are in luck as this one, though connected via Georgiana, can stand on its own without any confusion that reading a series out of order can cause. Inspector Robert Audley has been pulled off a case in Paris and ordered to a small country town where the Marquis de Maret is rumored to be a werewolf and a murderer. With his engagement to Lady Heather Littlefield threatened by these rumors the marquis is eager for Inspector Audley to put an end to them. But things quickly become complicated as “the famed inspector of Paris” Audley uncovers a tangled web of clues that point to not one but two killers as more are found dead, and finds that Lady Littlefield’s companion Georgiana Bingley seems to be far more adept at gathering information than he. Georgiana Bingley is the daughter of Charles Bingley and Jane Bennet, but little is made of this. All that is familiar to the avid Austen fan goes largely by the wayside because even though Georgiana is central to the story, where she comes from, who her family is, and any dowry attached to her is of little significance to this story. The main character of this tale is Inspector Audley. It is through his eyes (and thoughts) that we are led through his investigation and distraction. Because of this we are kept focused on the case, but even as Audley finds the case baffling, it is clear that his distraction is the only thing really keeping him from solving the case. Though the particulars were interesting enough to keep me reading, I did not find myself baffled by it in the least. When the main suspect in a murder is rumored to be a werewolf, there is a certain expectation I have of what would fuel that sort of belief, and in a rural community the belief in superstition is generally part of the driving force no matter how enlightened the population. But Altman keeps things light on the supernatural, staying focused on your standard investigative practices with the kind of lead following an inspector would under any circumstance. There is even enough attention given to the relationships between characters with the kind of reserve one expects with rules of etiquette and decorum, though being in France we are not dealing strictly with the English sensibilities Austen fans are most familiar with. I am no great historian, so I cannot speak to the historical accuracy of the French setting Altman uses, though she freely admits that there are “probably a lot” in the historical note at the end of the story. There was an interesting inclusion of Japanese philosophy in regards to elements and the code of the samurai, which historically appropriate or not, provided some characters with an added layer of depth and worldliness. The Japanese cultural influences, though enjoyable for me to read, however, did leave me with a sense of slight disappointment that Altman did not pull much from French legend or folklore, or even really mention Japanese legends that could have given the story a bit more supernatural eeriness without overwhelming the main plot. It is important to note that in the introduction Altman herself admits that “events of previous books don’t matter a lot in this one.” This would seem to mean that the tale has little connecting it to the Austen world or to the world Altman has created with The Darcys and Bingleys. Not having read any of Altman’s other work to know how this book might fit in with the series, I cannot say if it adds anything to or strays from the character of Georgiana Bingley as established in Altman’s series. Certainly her inclusion is the connecting factor, and without Georgiana an Austen fan would have no reason to read, though an Altman fan might. 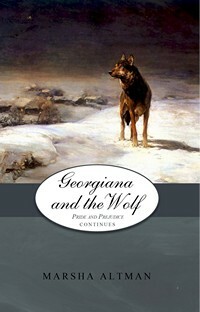 Over all, though I enjoyed reading Georgiana and the Wolf I found the Austenesque connection thinly made, and the mystery not very mysterious. Being forced to muddle through things with Inspector Audley felt limiting at times and unnecessary. There never seems to be a sense of urgency, though there clearly should be as one murder becomes another. The greatest point of interest is the character of Georgiana Bingley who I would have much preferred following, but which would have changed the story entirely. So, not the worst and not the best? For the reading list but not at the top? I’m partial to the Georgiana’s of this world, so I may give it a try. Thanks for the review! Altman is known in the JAFF community for bravely taking her characters on wild escapades and requiring her readers to take grand leaps of faith. This seems a fair assessment. Sometimes because the connection to original P&P is so secondary that she doesn’t seem to make much of it other than the name and she creates her own world. No doubt her fans will enjoy this detective story. Thanks for your thorough review. I saw this the other day while downloading kindle books and was curious. I have never wanted my readers to NOT be reading about wild escapades because why would they want to do that? I’m behind a couple of books in this series, and I really need to catch up. I enjoyed the first 3 books so much, mainly because Altman really made the characters her own. Thanks for alerting me to the newest book in the series.